Publisher provided a review copy at no charge. Aldo Zelnick can't figure out why living in Colorado automatically means he should like skiing. It doesn't help to have a jock for a brother who is good at every sport. To make matters worse, even his grandma can show him up on the slopes. Honestly, Aldo would rather stay inside where it's warm. Forget about a ski vacation. A sunny day in Hawaii sounds better and better to Aldo. By January, Aldo gets desperate enough to entertain the idea that he could do some successful hotdogging of his own on the ski slopes. After studying about Hercules at school, he musters some of the same courage and takes his brother on in a ski race challenge. Though things don't always turn out as planned, Aldo manages to get a much needed reprieve from the dreary days of winter. 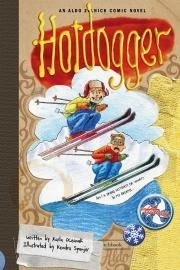 Hotdogger, the eighth installment of the Aldo Zelnick comic novel series will have the reader cheering on a much beloved protagonist while learning some great vocabulary words all starting with the letter H. Each novel follows a new letter of the alphabet in hilarious series of events that young middle grade readers can easily relate too. Bravo to the author for weaving in lively words that fit the situation and not merely building a list to check off. A fun addition to the wildly popular comic novel genre boys have come to love. **Publisher provided review copy to facilitate review. No monetary compensation was received nor do I accept compensation for book reviews.